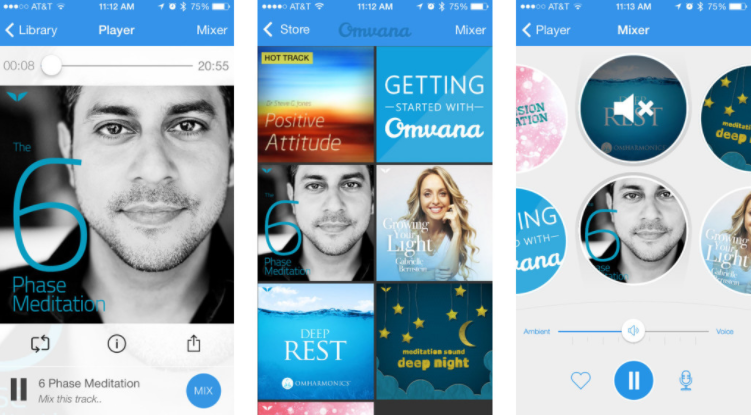 Omvana is a mobile- and web-based meditation app aimed at helping users to achieve various outcomes, such as reducing distress and enhancing well-being. Based on their needs and/or current state, users can choose any track from a large collection of (free) relaxation audios, yoga music, mindfulness meditation tracks, and narrated lessons and guides by different speakers (e.g., Bob Proctor, Laura Silva, and Martin Luther King, Jr.) ranging between 3 and 60 minutes. Users can mix narration (speeches, meditation guides, etc.) with ambient sounds, meditation sounds, relaxation tracks, and binaural beats to customize their own unique track. Additional features include the option to record a meditation track or personalized motivational track, and track recommendations based on the user’s current state (HealthKit). Users can expand their library by purchasing more tracks from the Omvana store.